This compatible HP Q2612AD (Q2612AD#004) 12A Dual Pack laser toner cartridges from InkTonerWeb.com is guaranteed to perform with your HP LaserJet 1010, 1012, 1018, 1020, 1022, 1022n, 1022nw, 3015, 3020, 3030, 3050, 3052, 3055, M1005 MFP, M1319, M1319f printer. 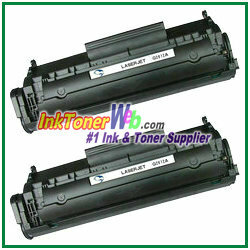 It replaces the original HP Q2612AD (Q2612AD#004) 12A Dual Pack toner cartridges. Our compatible (generic) replacement Q2612A laser toner cartridges are made in ISO9001 & 14001 factories and meet the highest standards of quality, reliability and exceptional yields, offering high-quality printing results as OEM HP Q2612A toner cartridges.